A man possesses nothing certainly save a brief loan of his own body, yet the body of man is capable of much curious pleasure. As I’ve written here before, ‘flow’ is one of my favourite experiences. ‘Flow’ or ‘optimal experience’ is a term used by positive psychologist Mihaly Csiskszentmihalyi, the most boring hero I have. With the concept, he describes the feeling you have when you’re so engaged in an activity that you lose track of time and place. Concentration is intense. Your activity challenges all your skills. Your self-consciousness disappears. Very briefly, I experience such a feeling of flow when I was running the 20 kilometers of Brussels yesterday. It was close to the half-way point in the Bois de la Cambre. I had trained in this park before, and exactly knew where the curves of the road would take me. On a bridge above the street, a DJ was playing music. I didn’t actively notice which song it was, but it fitted the rhythm of my steps. And though I already had suffered the heat before – and would still suffer it a lot more afterwards – at this point close to the 10k mark, I entered my flow and ran effortless. A large smile appeared on my face. I was euphoric. I experienced, I like to think, a runner’s high. A runner’s high, tells Wikipedia, occurs when people exercise so strenuously that their bodies reach a certain threshold. A switch is turned, flow is achieved. In chemical terms, it’s created by the release of endorphins during intense workouts. Endorphins reduce the sensation of anxiety and pain and cause feelings of euphoria. Running 20k on a warm day, like yesterday, is not fun. With a temperature above 20 degrees and a burning sun, I had to take regular breaks to get my body temperature down (I had gotten sun burnt the day before, and still felt a bit light in my head). But when I crossed the finish line after 2 hours, 12 minutes and 19 seconds, nothing of this mattered. All suffering disappeared. I was proud. I was happy. The body of man, Cabell said, is capable of much ‘curious pleasure’. Crossing the finish (to the left side, in a Dutch orange shirt). 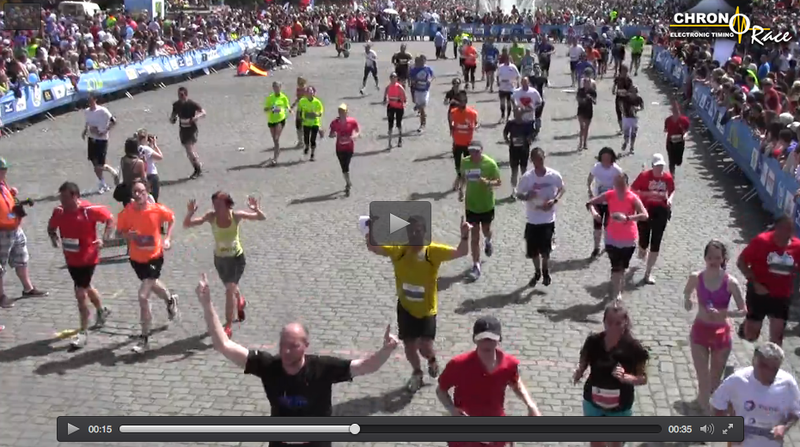 Screenshot taken from a video from the site of the 20k of Brussels.